Suppress is a rare Endurance action card. It is part of the Core Set. In addition to the card's availability in the Core Set, one copy is included in the Imperial Might deck. One copy is also obtainable in the Black Marsh Smugglers deck as a reward from Broadsides. 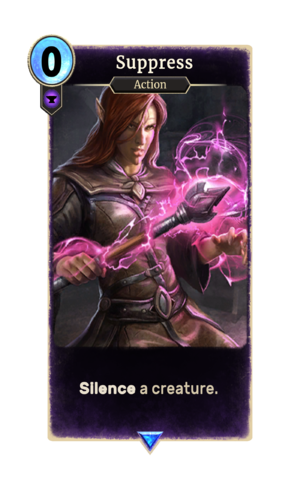 This card's ability applies the Suppressed card effect.